ASTORIA — These bathrooms need to get flushed. 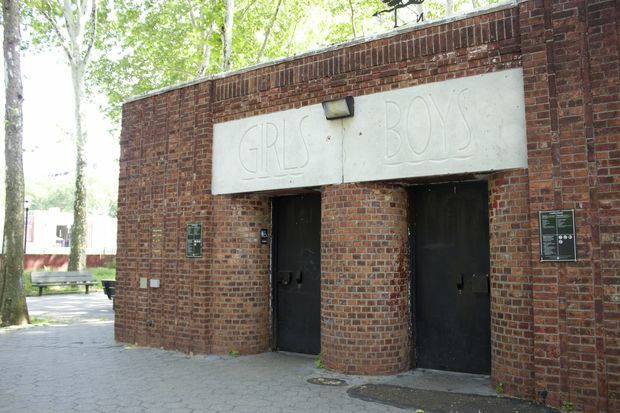 The restrooms at Charybdis Playground in Astoria Park are in need of a serious makeover, according to parents and a local parks group, who say the lavatories are too small for the crowded play space, and often dirty. The bathrooms are currently closed for the season due to plumbing issues, and Port-A-Potties have been placed there in the interim, according to the Parks Department. The Astoria Park Alliance recently held a "visioning session" asking parents and kids what they'd like to see changed at the popular play space. The bathrooms came out at the top of the list, the group said. "One thing that people over and over identified was the bathroom. That's not unexpected," said the group's co-chair, Martha Lopez-Gilpin, who said they've long wanted the comfort station overhauled. "We so desperately need the bathroom redone," she said, saying the bathrooms often stink and are too small. "We need more stalls. We're at peak capacity — it's really, really heavily used." Anastasia Papadopoulos, who was at the park recently with her 6-year-old daughter, cited the bathrooms as the playground's worst feature. "They were disgusting," the Astoria resident said. "They were dirty. They didn't keep on top of them." She and another mother said they would also like to see swings for older kids added to the playground, as it currently only has four bucket swings for younger children. The swings were another feature that came up multiple times during the visioning session, as well as requests for more play equipment and a better effort to keep the play space clean, Lopez-Gilpin said. Astoria Park Alliance is planning to hold another event in a couple of months to gather more feedback from the community about how the playground could be improved. Once collected, those ideas will be used to request capital funding from the city, she said. "Our goal is to get the conversation going," Lopez-Gilpin said. "Get people thinking about it, get their input and just get the ball rolling." People who would like to submit their own ideas to the group can email GetInvolved@astoriaparkalliance.org. Parks Department spokeswoman Meghan Lalor said the agency is "in discussions with the community on their vision for this park." "We will continue to seek funds for its improvement," she said.